Frank Gregory (1876-1940), shown on the step, may not quite resemble Robert Redford, but was a conductor for the electric cars that were being run by the Chicago City Railway . The car pictured is believed to be part of the #71 Ashland Avenue Line. This was the down-town Division and the route was as follows: Board cars on N. State Street at Lake Street, east on E. Lake Street to N. Wabash Avenue, south to E. Washington Street, west to N. State Street, south on State Street to Archer Avenue, southwest to S. Ashland Avenue and W. Thirty-first Street, south on S. Ashland Avenue to W. Seventy-fifth Street. It is believed that the photo was taken in 1904. 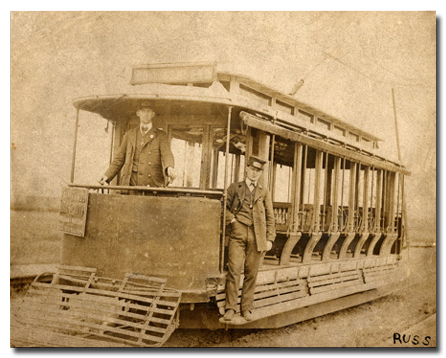 The electric car system was replacing the cable cars that replaced the horse drawn cars that were used for mass transportation for the City of Chicago. More information about the Cable Car in Chicago will be detailed in a soon to be released article appearing at our sister site, Chicagology.